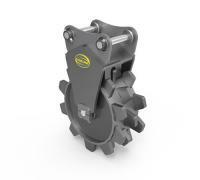 All Strickland Compaction Wheels include a removable O.E.M. Mount with pins and Soil Leveling Plate. Built using heavy duty greaseable bearings. Pad foot and sheep foot available for all weight classes.